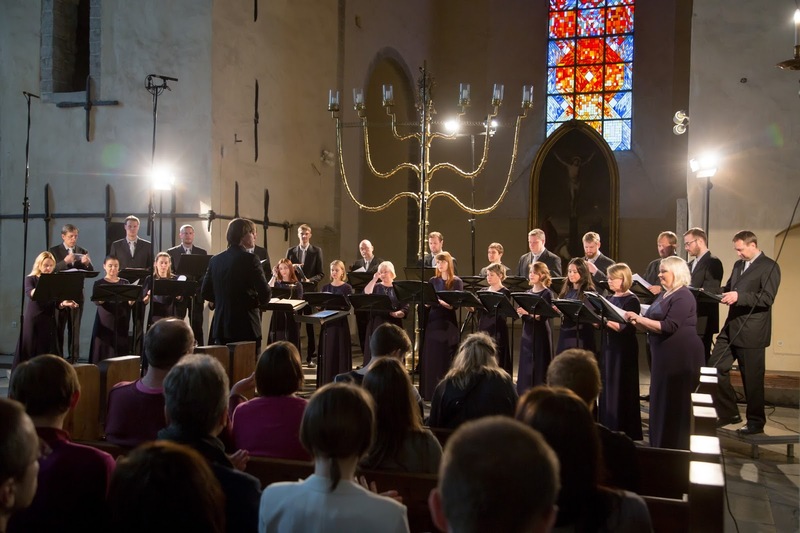 For the first concert of Saturday 8 April 2017 at the Estonian Music Days, we returned to Niguliste for a recital by the Estonian Philharmonic Chamber Choir, conducted by Kaspars Putniņš. The programme mixed contemporary classics with new Estonian music, Jonathan Harvey's Mortuos plango, vivos voco, György Ligeti's Lux aeterna, Salvatore Sciarrino's Responsorio delle tenebre, and the premieres of Tatjana Kozlova-Johannes' To my End and to its End, Evelin Seppar's Fields, my Fields and Mirjam Tally's The Land of the Tree Worshippers. Mortuos plango, vivos voco by Jonathan Harvey (1939-2012) dates from 1977 and is for electronics only. Harvey developed the piece at IRCAM and it uses only the sounds of the singing of his son (a treble at Winchester Cathedral), and of the largest bell at Winchester which is engraved with the phrase 'Horos avolantes numero, mortuos planco, vivos ad preces voco' ('I count the hours flying by, I mourn the dead, I invite the living to pray'). The result is a remarkable transformation of the original material which somehow managed to stay true to the idea of a boy singing and a bell, both recognisable yet changed. The 26 singers of the Estonian Philharmonic Chamber Choir, conductor Kaspars Putniņš, then performed To my End and to its End by Tatjana Kozlova-Johannes (born 1977), which set a text by the Palestinian poet Mahmud Darvis, a slightly intriguing dialogue between father and son as they struggle to find their way along a path. Kozlova-Johannes set the dialogue as solos divided between eight soloists (Ulle Tuisk, Annika Löhmus, Miina Pärn, Maarja Helstein, Susanna Paabumets, Joosep Trumm, Ott Kast & Henry Tiisma), surrounded by an atmospheric texture made up of hums, wordless music and non-pitched gestures, with the various lines of the solo emerging from and retreating into the choral texture, creating a strong sense of atmosphere and mystery. The individual soloists' English was rather variable, but the piece was about far more than just word setting. Next came another premiere, Fields, my Fields by Evelin Seppar (born 1986) setting a Russian folk text, a bridal lament where the bride says farewell to her childhood home, contemplates braiding her her for her marriage and begs her father not to marry her to a stranger. The piece was sung in Russian, and we did not have English translations but that hardly mattered as the emotional atmosphere of Seppar's piece was palpable. Seppar used multiple overlapping voices, to create a sense of lamenting with a musical line, sometimes sung by unaccompanied solo voices, which was very mobile and at times angular. The piece gradually moved from solo to choral texture, always with a melancholy sense of loss. Musical material was re-visited multiple times in different ways, always with Seppar's distinct sound-world, reaching an impressive climax. Salvatore Sciarrino (born 1947) wrote his Responsorio delle tenebre in 2001, setting fragments of Psalm 53, in response to Gesualdo's Tenebrae Responsories for Maundy Thursday. 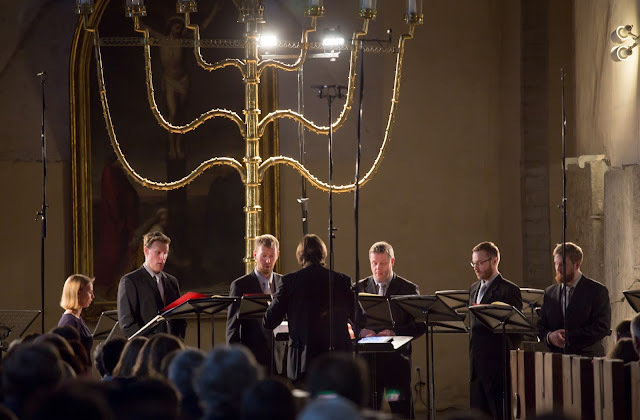 Using six solo voices (Ulle Tuisk, Joosep Trumm, Madis Enson, Kaido Janke, Ott Kask, Henry Tiisma), Sciarrino took a fragments of plainchant (sung by four of the men) and each time had the chant break-down and disintegrate. A single line passed between the soloists, and each expanded and elaborated on the material, the highly ornamented moments creating a real sense of desperation. The final work in the programme was Land of the Tree Worshippers by Mirjam Tally (born 1976). Written in 2015, this work used a text Estonian poet Kristiina Ehin, but Tally used an English translation (by in English (a translation by Ilmar Lehtpere) partly because Tally enjoys working with the variety of consonants in the English language. The text evoked the open landscape. 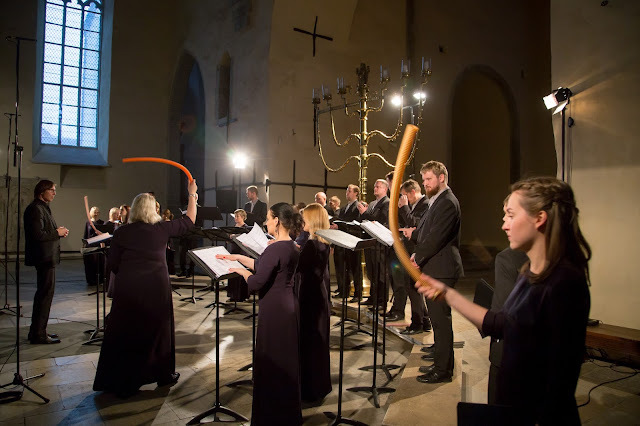 The piece started with just electronics, and then the choir came on whirring plastic tubes, and using bull-roarers to complement the electronics. The singers then added layers of atmospheric vocal textures to the electronics, with fragments of melody emerging from a very strongly textured sound-world using non-verbal and non-pitched sounds. At the end the choir returned to whistling and using the primitive instruments. It was not always possible to tell what was electronic and what was live, and I did rather wonder whether the piece needed electronics at all and that Tally should have had the confidence to write for voices and instruments alone. Though, in her programme note Tally talked about the singers surrounding the audience though this did not happen (they stayed firmly at the front) and you wondered whether this might have changed our appreciation of the music. This was a complex piece, well performed, though I felt that a degree of re-visiting and revision might improve it. This was a striking concert, full of virtuoso contemporary pieces from the shimmering textures of Ligeti to the striking vocal demands in the contemporary Estonian pieces and all received strong and confident performances from the Estonian Philharmonic Chamber Choir, under the confident direction of Kaspars Putniņš.